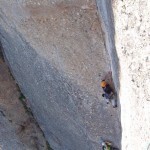 As the weather is extremely warm for being April we decided to climb in the north face of Montserrat, even though the first pitches were with sun, the temperature was great. 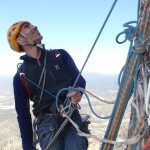 We choose to climb “Espero Nord ” in the right part of the “Serrat del Moro”, the long and vertical corner that easily can be seen from the hut of Sta Cecilia, because, was reequipped last summer, and I was the lucky one to go with the ones who did it!!. The route, was the classic “Sanchez del 68”, and still it is but now has few new bolts, and still some old pins that maintain the adventure character that had in the beginning. With 300 meters long the line its a bit discontinuous, mostly in the middle part, the higher pitches are vertical and steep though. The L2, the most difficult (in the photo, David trying it!) its rated as a 7b, 3 technical and long movements, (I didn’t succeed) the rest of the pitch is 6c. After that, the hardest are L8 and L9 sustained, and technical. Well, we all know that is very different when you go with somebody that knows exactly the route, the gear and the protection, but well, anyway, I’m not in shape right now and I just had a great day with my friends, Salva and David. 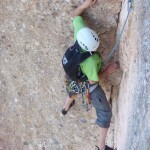 And, especially because for all of us it was the first route this year in this side of our loved mountain !!!! !.